The Inglot Noble Collection- feat. my favourite summer eye palette! A few weeks ago I had the pleasure of attending a special bloggers event in the Inglot store in Blanchardstown, where us very privileged bloggers were given a sneak preview of the Noble collection. In this collection, there are 5 eyeshadows, 4 gel eyeliners, a dazzledust shimmery loose powder and five pigments- all in various metallic/neutralish shades from gold, silver, bronze, pewter and rose gold. The various colour combinations are endless. I can't speak for anybody else but this was completely up my street- metallics and moi = bosom buds. I couldn't resist picking up a few items. I bought all 5 eyeshadows in the collection- I just thought they were all absolutely beautiful, and I could really see myself getting alot of use out of those bad boys. As you can see from the swatches below, these shadows pack a mean metallic punch without making you feel like the Tin Man from the Wizard of Oz. 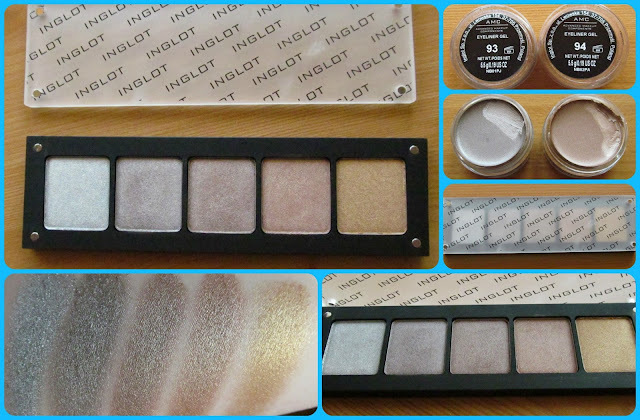 I actually feel like these are better quality than normal Inglot eyeshadows (which were already amazeballs!). I think these are five completely wearable metallic shades. I do not even know how it is possible but it made me very happy indeedy. I also picked up two gel eyeliners in 93 and 94, a lovely silver and bronze duo. I have used these as eyeliners for pops of colour but I have also applied these to my lid with a synthetic concealer brush to use as a base for different shadows (particularly a brown smokey eye over a metallic base- perfect work combination!). I didn't pick anything else from the Noble Collection on the night, but that's not to say I won't do so in the future. I am beyond impressed= pigmentation is amazing, lasting power is amazing, variety is amazing, price and quality, amazing. This is just a whole lot of amazing and if you veer towards metallics or an alternative neutral look, I strongly recommend you try these out. This is one of the best collections that has ever come out by any make up brand in my opinion. I am even tempted to buy another palette and display it in my apartment as art! My only criticism of the collection, as is always the case with Inglot, is that they did not name the various products with different shade names, and instead rely on the numbering systems they have in place to identify. I have oft ranted about this so I will not bore you again with the same rant. I have volunteered my services to christen all the eyeshadows if needed. If that is all I have to complain about however, it is very little indeed, and I am willing to forego names for such amazing quality products. I would love to hear what you think about this collection, and whether you are rocking some metallics this summer. Does anybody else join me in thinking that when it comes to eyeshadows in particular, Inglot can do no wrong? I've never actually tried Inglot shadows but these shades look lovely!